Graduates of the Engineering Technology ProE Certificate program will be equipped to operate in the new technological environment. 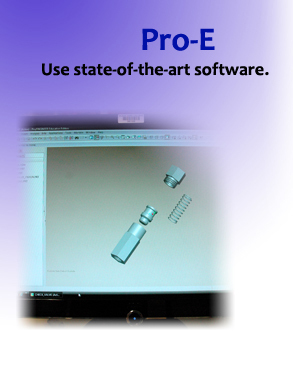 Pro-E is state-of-the-art software used by many manufacturers to model in three-dimensions and analyze design. BHC’s graduates are trained with Pro-E I and II. What does a Pro-E Technician do? A Pro-E technician use software to create design plans for products. They work in a wide range of industries from engineering and construction to manufacturing. Sometimes technicians begin with a 2D design for approval by the client or to gain feedback from engineers. Then a 3D display is created using Pro-E. Engineers then use the 3-D model to analyze a product, like a piece of manufacturing machinery, to see where improvements could be made. Black Hawk College Program: The Pro-E 15-hour certificate consists of five courses: Fundamentals of AutoCAD, Professional Engineering I & II, Computer Aided Drafting II, and technical math.